Baseball season is in full swing, and the world feels different to the Texas Rangers faithful fans on game days as we make the pilgrimage to Globe Life Park. The smell of hot dogs, the crack of the bat, the roar of the crowd, the 7th inning stretch…aaaahhhhhhh. Simply put, it’s the most wonderful time of the year in Arlington, TX (you just sang that in your head, didn’t you?) 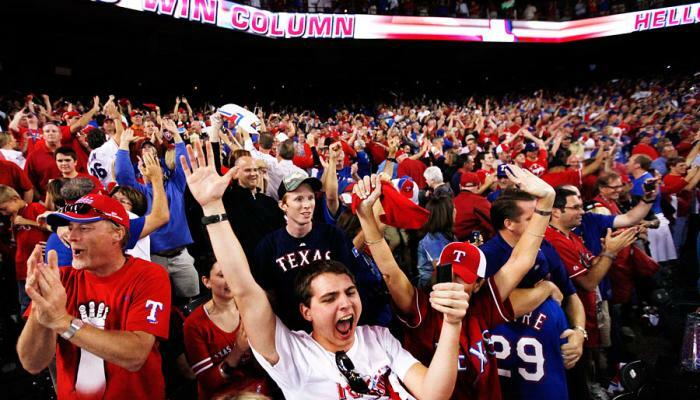 —and as always, you can count on us to help you get the most from your Rangers outings to Globe Life Park (and every game watched at home or at your favorite sports bar) a bit more convenient and lots more fun! This a great resource for the busy Rangers fan who needs direct-to-inbox Rangers news, info on ticket specials, upcoming promotions and more. Globe Life Park in Arlington is more than just the place where Captain and team hang their hats. The ballpark, considered one of the most architecturally cool ballparks in the country, offers a host of year round events. Previous events have included Yoga in the Outfield, the Fan Sleepover and event a Mascot Clinic! What&apos;s coming this year? See for yourself at their ever-changing online calendar. If you’re taking the time off for a vacation in Arlington, TX—or just planning some playtime in your own backyard—you can upgrade your Rangers outing with any number of cool things to do for kids, couples, groups and more. BONUS TIP: Download a FREE Arlington, TX Visitors Guide for more ideas before and after the game. As in Texas Rangers gear, that is. No matter if you’re an Opening-Day-Only kind of fan or your blood bleeds Rangers red, you can purchase everything you want or need in the way of Rangers apparel, gifts and more, either online or at Globe Life Park. Impress your friends and family with the latest stats and facts about your favorite Rangers players in this sortable guide, straight from the Texas Rangers website. BONUS TIP: If you’re a newsy type, you’ll want to check out ESPNs’ Texas Rangers Report and these updates from the Texas Rangers Newsroom. Among the services provided for Rangers fans with special needs are assisted-listening devices, mobility accommodations, closed captioning, and courtesy cart service. Rangers fans using wheelchairs also have access to seating throughout the park, often paired with “companion seats” that allow friends or family members to join you for the game. Contact 817-273-5131 or fanrelations@texasrangers.com for information, or visit the Guest Relations Center (located behind home plate on the main concourse) the day of the game. You can keep the spirit of the Texas Rangers with you all year long (and create a pretty swank office, living room or wo/man cave to boot) with these stunning, professionally-shot images of game-defining Rangers moments from this season and years gone by.